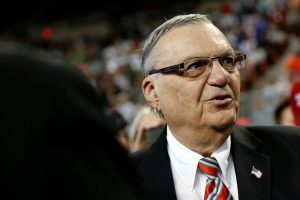 WASHINGTON — President Donald Trump on Friday pardoned former sheriff Joe Arpaio, the retired Arizona lawman who was convicted for intentionally disobeying a judge’s order in an immigration case. The White House said the 85-year-old ex-sheriff of Arizona’s Maricopa County was a “worthy candidate” for a presidential pardon. Arpaio, who became linked to Trump during the campaign for their hardline immigration views, was convicted of a misdemeanor for intentionally defying a judge’s order to stop his traffic patrols that targeted immigrants. Both politicians questioned the authenticity of then-President Barack Obama’s birth certificate and have a similar history in sparring with judges.